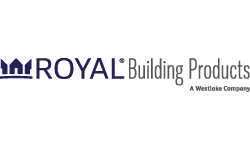 Build Royal with Royal Building Products, a leading manufacturer & distributor of building materials. Royal features an extensive line of high quality exterior cladding, trim, moulding & decking that deliver on homeowner demands for long-lasting, low maintenance curb appeal through high-performing, sustainable, energy-saving products. Royal is recognized for brands like Celect® Cellular Composite Exteriors, Zuri® Premium Decking, CraneBoard® Solid CoReSiding.